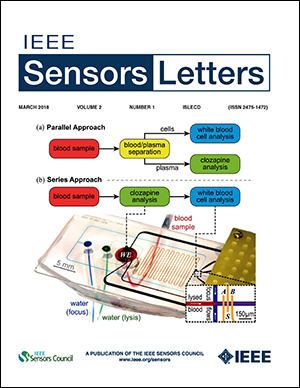 Research to build schizophrenia drug monitoring lab-on-a-chip devices by alumnus Thomas Winkler (BIOE Ph.D. 2017) and six colleagues is featured on the cover of the March 2018 issue of the IEEE Sensors Letters. The paper is a culmination of a four-year collaboration among researchers from the University of Maryland A. James Clark School of Engineering, the Institute for Bioscience and Biotechnology Research (IBBR), and the Maryland Psychiatric Research Center (MPRC) at the University of Maryland School of Medicine. “The Role of Microsystems Integration Towards Point-of-Care Clozapine Treatment Monitoring in Schizophrenia” present the first lab-on-a-chip device capable of label- and reagent-free concurrent sensing of cellular and molecular markers. The study is specifically geared toward schizophrenia treatment, where concurrent blood monitoring of the antipsychotic clozapine and white blood cells could lead to improved treatment outcomes. The researchers approach the challenge from a systems level, considering sensor integration both in parallel and in series. They evaluate the critical system components for plasma skimming (parallel) and in-blood clozapine detection (series). They find that plasma skimming is infeasible but, for the first time, demonstrate direct detection of clozapine in whole blood. With a corresponding series-integrated microsystem, they demonstrate downstream white blood cell analysis on the same samples using impedance cytometry. Winkler is currently a postdoctoral researcher at the KTH Royal Institute of Technology in Sweden. Co-authors include Florence Stevenson, a mechanical engineering student in the MEMS Sensors and Actuators Laboratory; Eunkyoung Kim, a faculty research associate at IBBR; Mijeong Kang, an IBBR postdoctoral researcher; Professor Gregory Payne (BIOE/IBBR); Professor Deanna Kelly (MPRC); and Professor Reza Ghodssi (ECE/ISR). The work was supported in part by the National Institutes of Health, the Robert W. Deutsch Foundation, and the Maryland NanoCenter and its FabLab.